American brewery Dogfish Head has a saying: "Analog beer for the digital age." And its latest product, a collaboration with Kodak, proves that there is truth to that mantra – SuperEIGHT beer actually develops Super 8 film. The journey began last year, when Dogfish founder Sam Calagione was a guest on Kodak podcast The Kodakery. During that appearance, he learned that sufficiently high levels of acidity in specific beer could enable them to be used to process film stock. Calagione took the interesting factoid as a challenge, and set about developing a new gose that would develop old film. 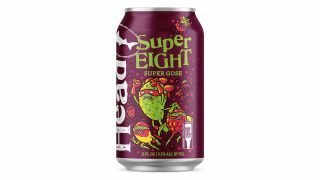 As it happened, he was working on a beer with eight ingredients – prickly pear, mango, boysenberry, blackberry, raspberry, elderberry, kiwi juices and toasted quinoa – that he was calling SuperEIGHT. With those concentrations of fruit it was inherently going to be a beer with high levels of acidity and vitamin C – the key ingredients for processing stock. So, while perfecting the recipe, Dogfish sent batches of the new brew over to Kodak to see if it could indeed develop film. The proof of the brewing is in the drinking – or, in this case, the processing. The new beer developed film so successfully that Kodak actually partnered with the brewery to produce a short movie, shot on Super 8 film and developed with SuperEIGHT beer. The result was used as a special instalment of Kodak's #Filmtravels series, shot on Tri-X Reversal Film stock. If you're actually interested in drinking the stuff, rather than dunking film in it, "the unique ingredients give SuperEIGHT a vibrant red color, with delicious flavors of berries and watermelon, along with a tart – yet refreshing – finish." At 5.3%, it's also got a little pep in its step. SuperEIGHT will be available across the United States, in 12-ounce cans, starting in April.